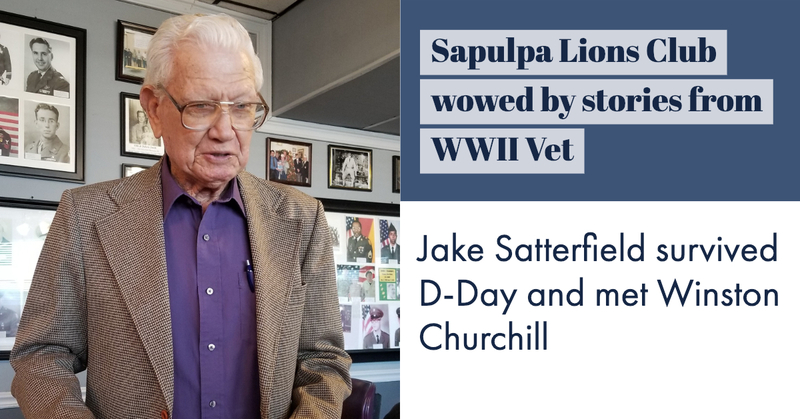 The Sapulpa Lions hosted a World War II veteran, Jake Satterfield, and packed the Veteran’s Room at the Steak & Eggs Restaurant on Wednesday at noon. The “Lion of the Day,” John Mark Young, brought the guest speaker to the Lions, after having read a Tulsa World article about him, and then found out Satterfield lived in Sapulpa. Jake Satterfield began his speech saying, “I couldn’t discuss nothing about where I’d been. It was horrible! Couldn’t even talk to my family.” He said it had helped him to talk about it. He was born in 1924 in Mountainburg, Arkansas. His mother refused to sign papers for him to join the service before he graduated high school. He had polio for 2 years as a child, and was worried they wouldn’t take him. “Germany was taking over countries,” and he wanted to go. The quonset huts were built as R&R sites for service members to be able to get out of the fray for awhile. His team worked long shifts, wading in knee-deep mud to accomplish these projects. “It was foggy, never saw one, I could hear it…Had just enough fuel to get to London, and ran out of fuel. Winston Churchill and the Prime Ministers of Australia and New Zealand came to visit the troops. “It was a very good visit. He talked to each one of us. He was not show-off, but real calm.” Churchill was down to earth with the boys, he said. He operated a crane. “I had back trouble once in awhile and the guys had to pick me up and get (me) up in that crane.” He spent one year operating the crane. He didn’t tell anyone he was hurt because he didn’t want to get shipped-out to sick bay or back home. Then, they sent them headed to the West Coast, but when they arrived at Pearl Harbor, they found out there was no room for them in California so they headed to Norfolk, Virginia. The war had ended by then. He was invited to Bishop Kelly to speak to the kids, but he wasn’t sure he could talk about it. He got through it. Did you go back to New York? It’s a sad reality that men like Satterfield are becoming fewer all the time, and with them, we’re losing the stories like those he told on Wednesday. How can we encourage those we have left to share their stories? Lottie Wilds contributed to this story. So very proud to call Jake Satterfield my friend!! Love you, Jake! Jake is one of the sweetest men I know. So proud to say I know him! And I get to hug him every Sunday morning! God has blessed me with Jake’s friendship.